Repost from 2008; I promised some people. Will be in 2 parts: this reading notes post with some afterthoughts added that I originally posted later, and a deconstruction of the names. Somewhat edited (for instance the link to the book text now points to Gutenberg; it wasn’t there yet when I first posted it). I don’t know what prompted it [ETA: a daughter trying to keep a beer bottle from squirting by plugging it with her finger], but I read Hans Brinker or the Silver Skates. And couldn’t stop reading it once I was underway, though it’s very dated (that figures; it was published in 1865) and it kept me wishing I had a time machine so I could go and be Mary Mapes Dodge’s copy editor, because she badly needed one. It’s surprisingly gripping. 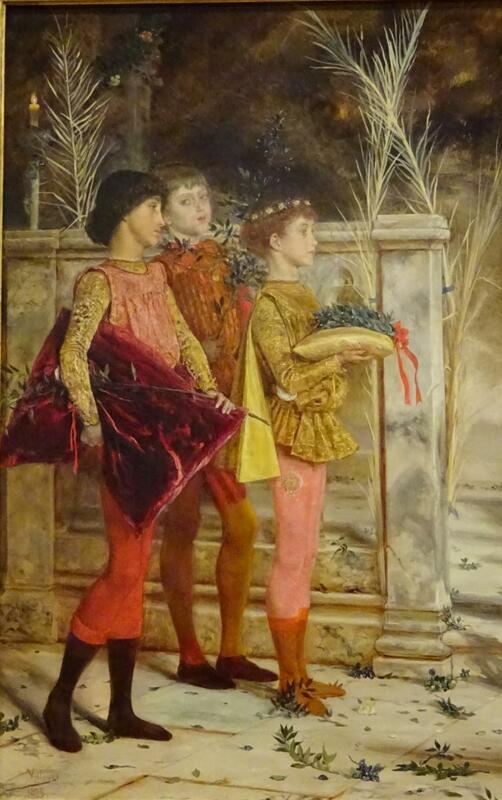 Note that Hans Brinker is not the name of the boy with his finger in the dike. It’s a story-in-the-story in this book. That story is not, and never has been, something that every Dutch child knows; it’s only known in the Netherlands from translations and retellings of Hans Brinker or the Silver Skates. I shudder to think that whole generations of children in the United States had most of their knowledge of the Netherlands from this book alone. No wonder so many tourists arrive with serious misconceptions. The style is uneven: pleasantly entertaining narrative with sudden outbreaks of lyricism (but that’s the nineteenth century for you) and expositions of history (ditto, I think) or heavily coloured accounts of Dutch culture. I won’t go into the facts I think she got wrong. Some of those may be things that really were that different in the mid-19th century (but did literally every man smoke a pipe all the time? 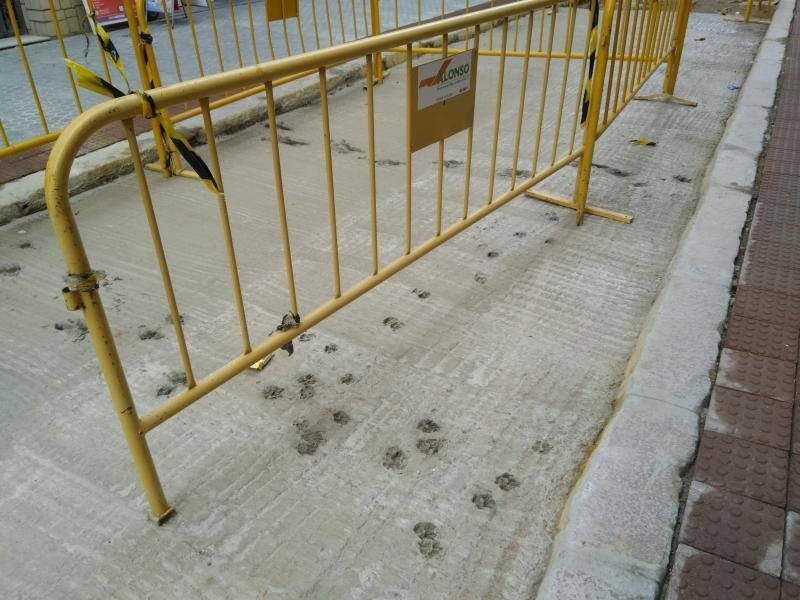 and did harbour workmen work completely silently? ), some may be because her only source for Dutch culture at the time was one old couple who had emigrated to the United States as children. That also explains why she states that there’s ice thick enough to skate on the whole winter: the first decades of the nineteenth century were the tail-end of the Little Ice Age, and the old couple may have remembered that from their own childhood. She got a whole lot of facts right, too. The middle part of the book, chapters 10-14 and 16-31 (of 48), is a travelogue and history lesson, not really relevant to the plot so most abridged versions cut it. Here it’s obvious that the author did do her research. The Rijksmuseum and the Mauritshuis still exist, and still contain most of the things the characters see there. It’s the wrong names –some spectacularly wrong– that vex me most, and I’ll have a shot at them. The most striking one is Voostenwalbert Schimmelpenninck: the surname does exist, but nobody except this boy in the book has ever been called Voostenwalbert. Ewoud Sanders wrote in 2007 (NRC, article sadly no longer available online) that Dodge might have read the name of “W. Albert van Oosten” written indistinctly as “v.oosten w.albert”. I’ve put the deconstruction of names in another post because it was getting long, and I thought people might want only the list. There’s a statue of the boy with his finger in the dike in Spaarndam. According to this rather good article about Hans Brinker (in Dutch), it was placed there for the American tourists, who all wanted to see exactly where the boy had put his finger in the dike. Also, I recommend reading past the pictures of the statue in the first link. This made me look up the Wikipedia article, which turns out to be surprisingly accurate and complete. And of course, there’s a non-zero chance that the boy with his finger in the dike –if, which I doubt, he existed at all– was also called Hans, or rather Hannes. At A Coruña I did sort of offer to give a ten-minute talk at the next Akademy where I’d find myself, but I haven’t been following the open software world much and my talk would be social rather than technical (“Users Versus Developers”) so I don’t have the grounding. Not that I’d feel any more confident with grounding, but if I tried to get something together I wouldn’t have enough facts to please the nerds, including myself. I might try to make some notes if I think there is really still something to talk about. But I’m looking forward to it: first a nice long train journey, then a city I’ve never been to before, and seeing lots of lovely people again (and probably a number of lovely new people). I am down for the training in online fundraising and campaigning on the Thursday, because that’s something I feel I should be able to do but don’t know the first thing about (duh, that’s what training is for, right?). It might be interesting and useful, or it might be miles over my head, or it might be terminally boring like a similar corporate thing I went to years ago and completely forgot the details of the moment I left the room. I hope the first, of course (but fear it will be the second). Mostly, though, I’m going to Vienna. We’ve got a proper city and museum trip planned around Akademy. Deventer is officially 1250 years old this year, and one of the things we’re doing to celebrate that –did yesterday, in fact– was an ecumenical procession. The previous procession with the relics of St Lebuinus (counted as the founder), St Radboud and St Marcellius, decades ago, was a completely Catholic affair, but this time all four churches in the town centre (Roman Catholic, Russian Orthodox, mainstream Protestant and Mennonite/Remonstrant) did it together. Some of the reliquary carriers were Protestant, and two men from our parish took turns carrying the icon of the three saints. I remember a planning meeting in mid-2017 in which I said “oh, we have that icon, let’s carry it along” — either that was the beginning of it being completely ecumenical, or it was in the air already and it seemed the natural thing to do. The Roman Catholic church had provided an auxiliary bishop, who blessed the procession when it started, praying for “a pious and joyful procession”. And it was, both! In the main shopping street I saw a man and a woman come out of a shop, look at the procession a bit bewildered, then join in. Later I heard from other people that they’d seen similar things. We started out with about 100 people and arrived at the church where the reliquary “lives” with at least 300: people were hurriedly fetching extra chairs from storage.It was only about a mile but it took us all afternoon, stopping for prayer and song at several places. As for song, I wrote a troparion for St Lebuinus for the occasion! And now every time the 16th of November is a Sunday — not until 2025 because 2020 is a leap year which makes it a Monday– we can sing it in the Liturgy. I went to a small restaurant alone where I’d been with Spouse not a week earlier: not hard to find, but hard to get to, down a flight of stairs that were almost a ladder to a rickety landing at the side of a narrow town-centre canal, possibly in Utrecht. I knew that they had a fairly small menu: two beef dishes, one pork dish, one chicken dish, and possibly one each of fish and vegetarian too but I won’t swear to that. If you wanted beef, you had to choose the sauce first of all (from two different ones), even before ordering an aperitif or a starter. The waiter/proprietor came to ask which sauce I wanted. I said “I don’t want any sauce, I’m going to have either the chicken or the pork”. The chicken was an interesting-looking meatloaf en croute incorporating fruit, the pork a roulade wrapped in bacon (both with pictures in the menu). I sort of tried to ask if the sweeter sauce would go with the pork as he was so insistent that I choose a sauce, but he kept steering me to the beef. More convoluted dreams in which I was keeping a large old book safe for my father-in-law in various public transport, and seeing film footage of my father-in-law as a boy of about thirteen with light-coloured curls — it was black and white film but I knew he’d been a golden-haired boy with many older brothers and sisters who were all nasty people (in waking life he has grey previously-dark hair and only one younger brother, a friendly inoffensive man). I’d inherited a large old house with everything in it, and a lot of money as well (either in the bank/securities/whatever or in chests in the house). With the house came a man of affairs, a spare dark grumpy person who showed me everything from the attics down. When we got to the ground floor, there was another man of affairs, not as spare, dark or grumpy, and the first one had never heard of him (or vice versa). I left them to fight it out together — they did, with words mightier than the sword — while I tried to find a way to the cellar. I had a barrel full of ping-pong balls and/or golf balls: white, that size, not all the same weight, and overturned it so they would roll and find a way down. Which happened. The last two balls rolled round and round a two-inch-square hole and then tumbled in. Obviously I couldn’t get through that hole, but I did know how to get to the cellar now (perhaps I’d also found the stairs) and went down, only to find a woman of affairs who had never heard of the two men but knew everything about the house, including the worth of each and every object in it, and made it clear to me that I was even richer than I’d already thought. We went a lot. The evening we arrived we found the nearest church — Basilica de Jesús del Gran Poder — and though the company was congenial with lots of little children, the next church along (with an entrance in the same block), the Iglesia de San Lorenzo, where a very old priest served Mass for a handful of people every weekday morning except Wednesday, fit us better. Gilded baroque angels are a better sight in Easter time than Christ carrying a cross as if it’s Good Friday. But on both Sundays we got the opportunity to go to our own church: an Orthodox church of our own jurisdiction, the tiny parish of San Serafín de Sarov. I can’t really be coherent about it, only rave in bits and pieces. I’m so glad we found it; I love Roman Catholic services but a steady diet of them doesn’t agree with me, rather like Spanish restaurant food. There was a very old priest, too old to serve: Archimandrite Pablo, and a younger priest, Padre Victor, who did all the serving. The archimandrite spoke English, and Padre Victor only Spanish, but so clearly that we could understand the sermon, which is more than I can say about any Catholic priest I listened to in Spain. It felt so like home. One thing that was really different was that there wasn’t a choir so everybody sang, occasionally spurred on by the priest’s cheerful “Todos!” and his singing of the first line, which was uncomfortable for me because though his singing voice sounded deep it was actually high in pitch. The first Sunday there was an alto behind me so I could crib a bit, the second Sunday she was on the other side and I had someone behind me who sang at no discernible pitch at all (but with great conviction). If I lived there, I’d probably try to round up a couple of the better singers and, if not form a choir, at least practice. But perhaps they do that already because there were several people with good voices who knew both the words and the tunes. (I picked up a simple sort-of-first-tone melody for the Beatitudes, and I’d have memorised the first-tone variant used for the Second Antiphon, “Spanish first tone” in my mind, if I hadn’t been distracted by the Beatitudes on the second Sunday.) There were printed booklets, very useful: Spouse said following the service on paper made him much more aware of the structure of the Liturgy — of course I’m used to always having the choir book, but he gets only the linear sequence, and only a small part of it while he’s serving. The second Sunday I was looking up something in the liturgy booklet during the Hours, and the woman reading the Hours promptly came over and gave me an Hours booklet, which (even though she’d jumped to the wrong conclusion) was actually very nice to have because I could read along with the Psalms. It’s a very international parish: they have the same habit we have of praying the Lord’s Prayer in all available languages, and we had Romanian, several Slavic languages, one language we not only didn’t understand but didn’t even recognise, and French, as well as Spanish and Church Slavonic. We were asked if we could do it in English the first time, and we said “we can do it in Dutch!” so we did. It was nice to see people smile at that, “a new one!” They also do the forty-times “Lord have mercy” in four languages: three in Spanish, three in Greek, three in Romanian, three in Slavonic, repeat twice, then three in Spanish and one in Greek. I wish we could do that too, but I’ll probably never get Choirmistress to agree. To catch everything I should perhaps do a Mystery Worshipper-type questionnaire, but let me say only this thing: every part of the service was like being in Heaven. Our apartment is still wonderful. Even the times when we can’t sit in our tiny patio because it’s too warm, or the neighbours pour something stinky down the drain, it’s no penance to be inside. To get inside, we need four different keys. We have two bunches of keys and none of the shapes match, but I’ll describe the ones we use most often. The green iron gate needs the smallish round key. It was fairly hard to open it from the inside until we found out that it needs to be pulled a bit. It closes by itself, but there’s so little room between it and the front door that you can’t close it until you’re inside. 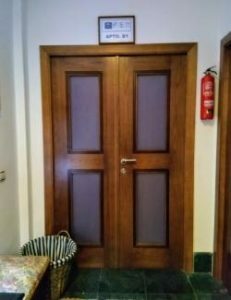 On the other hand, there’s so much room between it and the front door that it’s awkward to try to lock the front door when going out unless it’s still open. The front door itself has two locks, but we use only the upper one. It closes by itself, sort of, but we’ve been asked to lock it whether we’re in or out, unless we’re only in and out for one moment to fetch something or use the toilet. We usually lock it anyway because it’s become a habit. It needs the intricate safety key. 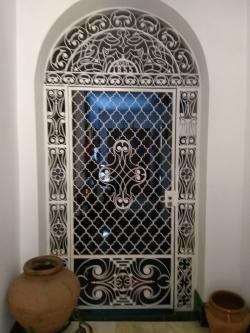 The white iron gate needs the eight-sided key, and I call it “the Anshen gate” in my head because of that. It announces that it was made in 1855. Closes by itself with a satisfying metallic twang. The apartment door needs the symmetrical-trapezium key (can’t find the right terminology: it’s like an equilateral triangle with the top lopped off) which fits slightly below where one thinks it fits so it can be hard to unlock the door. We lock the door and leave the key in when we’re in, though there’s probably no danger in leaving it unlocked. I was going to say “we did all the tourist things” but we did pointedly not do some of the more obvious tourist things: skipped the bullfight, the flamenco evening, the sightseeing bus, the boat tour. Even though we were so easy to recognise as tourists that bright young women and boat-captain-uniformed men kept trying to press flyers on us. (My father-in-law, who we went to Málaga to meet because he’s staying about 40 minutes by bus from there, did go on a tour of the bullring –when there was no fight on– and told us how badly he saw the bulls being treated, so even if I’d been interested for cultural reasons I wouldn’t have wanted to go. The fake knight tournament in A Coruña in 2015 was much more fun!) As I already thought, carrying a heavy shopping bag full of groceries protected me 100% from tourist touts, even though I was wearing my ordinary clothes (no little dark blue cardigan) and hadn’t dyed my hair black like most Spanish women my age seem to do. I bought a new purse! 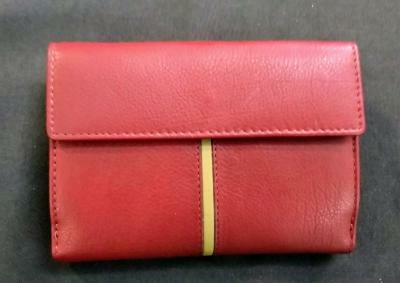 A wonderful red leather one with RFID protection inside. Pity I don’t have my new bank cards yet to protect in it. 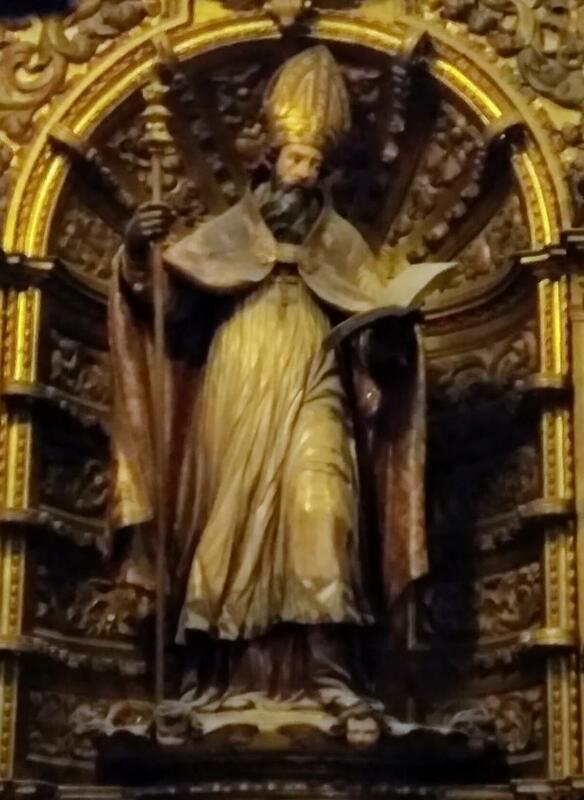 All I have is some money and my St Anthony medallion and today’s bus tickets and a couple of receipts that I’m keeping because they have Castilian, Basque, Catalan and (I think) Galician on the back. I also had a restaurant promo card, but gave it to some LGM people who considered going to that restaurant. 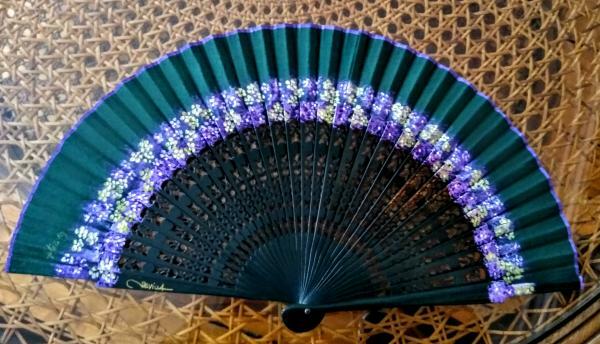 I also bought a hand-painted fan in a real fan shop where people buy stuff they need to be a Spanish lady or gentleman. We went back to the Museum of Fine Arts. We were actually planning yet another visit, so Spouse could do some more drawing and I could sit down in front of an artwork and let it inspire me to write, but the afternoon we were keeping for that (Tuesday, after the admin stuff) both of us were too tired and hot and thirsty and lazy to do anything else than sit in the patio drinking anis seco with a lot of ice cubes and reading. Like many museums of fine arts where we’ve been, it must have started as “we have all these things we inherited or collected or accidentally acquired otherwise, let’s show them”. This one’s collection was mostly from the confiscation of monastic property in the nineteenth century. 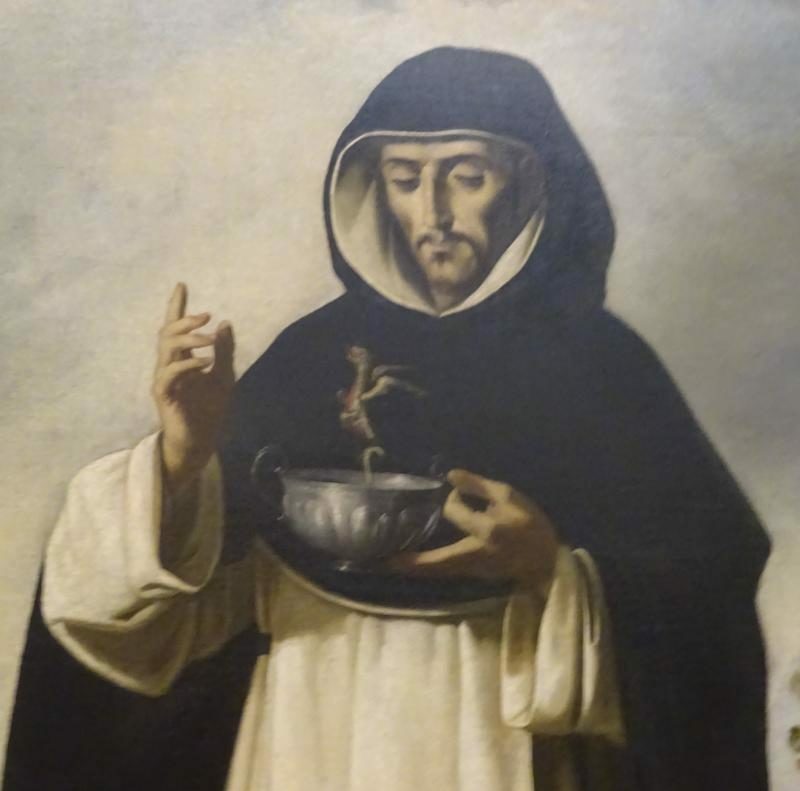 There was a small exhibition of paintings by Murillo, whose Inmaculadas are not at all boring, and some interesting other stuff. The Duchess’ pages, who might have been painted by Lawrence Alma-Tadema (but in fact it was José Villegas Cordero; they’re contemporaries). Pajes de la Dogaresa (1888). Cunningly cut out of their hideous gilded frame. Apart from several schools and at least one street called after him, there seems to be very little evidence here that he’s important. Not even a medallion in the church-tat shops, though I found my bone St Anthony of Padua medallion while looking for an Isidore. The Orthodox church where we went on Sunday, and will go again tomorrow, has lots of icons for sale but no Isidore either. We went to Real Alcázar (still not “the”, though that Wikipedia article is of two minds about it). More groups, though mostly French and some English and German rather than Asian. I felt that I was in the way of everybody’s pictures all the time, and I was becoming more and more unhappy until we managed to escape to the gardens. I still don’t know if the whole thing was disappointing — after all, we saw only the public part, not the famous royal apartments — or there were just too many people to feel the mood. I also found I liked the intricate stonework better than the tiling, but that could be a function of preferring (monochrome) quiet to (colourful) noise at that moment. One question about the tiles: are these lions trying to eat snakes, or snakes trying to bite lions in the tongue? Publishing this after the fact (though written in stages) because I was completely sure that people would have replied with advice, on the blog, on Mastodon, on Twitter, even if I’d asked explicitly not to do that. Advice from people not on the spot would have made me much too nervous. I had all the help I needed: see the “Good people being good” section at the end. 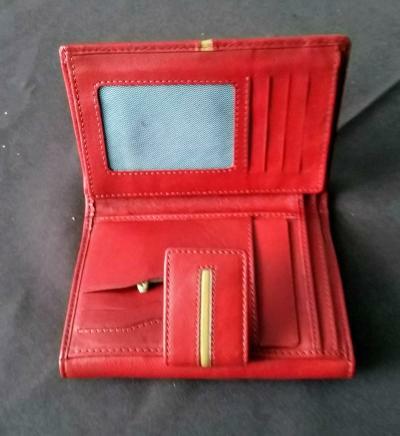 I was robbed of my purse (wallet, if your dialect has that; the thing I keep my money and cards in, not the thing I keep that thing in) in Barcelona. When we came out of the history museum (with the Roman city underneath) it was raining and we’d both left our umbrella at the hotel, so Spouse went into a tourist shop to buy some, and I stood in the entrance looking at mosaic lizard key rings. (I still want a mosaic lizard key ring! Because LIZARD. Also MOSAIC. I might go and get one when we have half an afternoon in Barcelona on the way back.) Then I felt myself being jostled, turned, and saw a middle-aged American woman (I knew she was American because she apologised to me and I heard her accent) fumbling with her umbrella. Then we went to eat at the Bishop’s Cafe, and when we were leaving I picked up my bag somewhat clumsily and my phone and pen fell out. Out of the compartment where the purse ought to be as well. I emptied my whole bag. I searched on the floor, and also on the floor near the seats we’d had before we realised that this was a place where the staff seats you (and saw several sets of people who came in after us being seated before us; we should have stayed where we were). We asked at the cash register. Nothing. “Then you’ve been robbed,” Spouse said, but we went back to the museum, the last place I’d had it, because I remembered putting the euro coin from the locker in it and it in my bag AND ZIPPING UP THE BAG COMPARTMENT. And Spouse also remembered me zipping up the bag compartment. Good thing, because otherwise I’d have blamed myself even more than I already did anyway. Nothing at the museum either. Spouse remembered that he’d seen a young man who didn’t look Spanish walk (not run) away when he came back from the shop and found me saying “no problem” to the American woman. Now if I hadn’t said when arriving in Barcelona “there’s no need to keep my ID in my phone case any more” I’d still have it. (But Spouse said that if he had an ID card instead of a full passport, he’d keep it in his wallet as well.) The thief was in so much of a hurry that he (I’m assuming it was that young man and not the American woman) didn’t take the phone with much more monetary value, but the purse that was on top, containing only 4 single euro coins, a tenner in the outside pocket (which I completely forgot to mention when I was at the police station; it’s my semi-secret emergency money), some cards that got blocked right away unless he wants to travel by public transport or go to the museum in the Netherlands and disguise himself as a middle-aged woman, and a lot of things with only sentimental value like the lock of strawberry-blonde baby hair that was cut from Prima’s head when she was christened. Another annoying thing is that I finally had the PERFECT purse and I don’t know if I can find another that fits me so well. The hotel receptionist knew where the police station was: quite close. She gave me a printout (A4 sized) of my ID which she’d scanned at registration, and also said that she’d been robbed in town several times as well, it’s just something that happens. At the police station we were referred to a woman called Marta, petite and wow-grade beautiful, who was at that moment helping a young man who’d lost his public transport pass, in fluent French. With us she spoke fluent English. She filled in all the papers, asking for things I’d never have expected (my father’s and mother’s first names! But as Spouse said, that’s part of your name in Spain) and even calling the embassy for me so I could apply for an emergency passport. The embassy man was sort of helpful but exasperating because he went far … too …. slow … for me, as if I’d never heard of a web address before. I appreciate it if people who are going to spell something say it before they spell it so I know what to expect! As it was, I’d written half the thing before he got to one-quarter most of the time. It was especially exasperating that he told me to “write along with him” EVERY. SINGLE. TIME. And even then, I still had some questions, and Spouse thought of a couple more questions afterwards. But what I had to do was to scan or take pictures of all relevant documents, attach them to an email message, and write in the email message exactly where we were going to be and when. That seemed doable. So I downloaded the forms he’d told me to download and fill in, and ran into the next problem: I had to sign the forms, and couldn’t do so on the laptop that I could fill in the rest of the forms with! I called the embassy again — this time they were already closed and not open until Monday, but I was put through automatically to the consular whatever, exactly what I needed anyway — and I got another person who told me to print the forms and sign them and take photos and attach those. She could also answer my other questions! When I went to the hotel reception desk with the printing problem they gave me an email address (of the reception) to send the forms to so they could print them. Then I noticed that I’d filled in ’20’ instead of ’16’ in the “when was your ID issued” field, because the form took only two-digit year numbers and I’m so used to typing “20xx”. Could amend that in the print, though. The mail message came back: size too large for server. Eventually I had to split it in four discrete parts with different attachments, but they all got sent. At one point Spouse noticed the date and said “I’d almost become superstitious!” And yes, it was Friday the 13th. Then we had dinner at the hotel because we were too knackered to think of anything else, and the nice waiter was nice. Next problem: we would be travelling on the AVE (high speed) train, with our Interrail pass, and you need ID for that! So we went to the station on Saturday morning to sort that out so we wouldn’t have to do it on Sunday morning and possibly miss the train. The man at the general train information office pointed us to the renfe information office, which was invisible from the station entrance, but there was another very helpful woman (called Carolina according to her badge) there who didn’t speak as much English as Marta but it was enough, and she called someone else in Catalan who knew more than she did, and told me that they were practically sure that I’d be able to use the Interrail card and get on the AVE with the copy of my ID and the police report. Update: as I wrote in the other post we were just waved through when we showed our Interrail passes. In Sevilla I got email from a Spaniard at the consulate, in passable English, saying the consul in Sevilla was on holiday but he’d get the things done for me, and did I have a phone number? I was surprised that I’d apparently forgotten the phone number in my first email because I knew they might want to call me, but I gave it and asked if I needed passport photos, and then got another mail immediately, giving me an appointment for Tuesday the 24th at 11:00 and asking me to bring two passport photos, 47,50 € and all the originals of the documents I’d sent pictures of. While we were exploring a new part of town Spouse spotted a photo booth! So I had a sheet of very bad photos taken (bad as in: doesn’t look much like me, but the quality is adequate and there was a clear explanation of “how to take an official identity photo” so it’s acceptable). It’s a good thing because we didn’t see any shops advertising passport photography like in our home town. There were a few shops selling cameras, and one specialising in photos of weddings and First Communions, so I’d probably have asked there otherwise. Tuesday the 24th rolled along (yesterday as of writing this part) and though I knew it couldn’t really go wrong I was still nervous. The weather didn’t help: nastily muggy even at 8 in the morning. 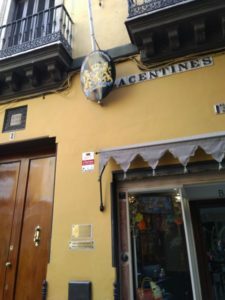 But we found the consulate, and being twenty minutes early we walked around in the neighbourhood for a bit: little streets with fabric shops, notions shops, wool shops, flamenco-dress shops, flamenco-notions shops, ecclesiastical-fabric shops, ecclesiastical-gear shops and antique shops. At one of the antique shops I found a bone medal of St Anthony of Padua for 2 euros! That lifted my spirit considerably. Then it was 10:55, the properly Dutch time to be just too early. The consulate is on the first floor of a house full of offices and residences, with a wonderful courtyard (that I didn’t take a picture of, because there were people living there). We were greeted in the courtyard by a short stocky middle-aged Spaniard called José who I somehow thought was the consul’s secretary, but he is in fact the honorary consul himself (I’m glad I found that out right now, not before I went, because it would have made me even more nervous while dealing with him). The consul’s secretary, who sent me the mail, is called Julio. I filled in a form with the things that go on a passport (name, date and place of birth, that kind of thing) and got another form to fill in but I could hand over the one I’d done in Barcelona instead. I signed with a special indelible pen and parted with two of the awful pictures. I now have a blue laissez-passer, and José told me he’d special-cased me because I wasn’t only using it to leave the country immediately by plane, but to travel via Barcelona and Paris over land. In fact what I’ve got now is a passport that’s valid until the end of May, and I need to go to the town hall and apply for a new ID before then. Easy: I’ve got all of May to do it in. Only it’s another annoying expense, of course. I’m not sure yet whether I’ll get better pictures taken or just use another of the awful ones. We were shaky and needed coffee, but all in all it had only taken twenty minutes. The hotel receptionists and waiter. The man at the bank customer service. Marta at the police station. The woman I called at the embassy (and also the man, because he was doing his best, and I acknowledge that at least 80% of people he deals with on a daily basis would have been in more of a panic and/or wouldn’t know how to use the internet). Carolina at the rail information office. José the consul. And Spouse, of course, who was the main reason that I wasn’t in as much of a panic as I might have been. (I’m usually very cool when other people are in trouble; he probably has the same skill and it rubbed off.) All these people deserve a special place in Heaven. My head is full of stuff. We’re so glad we’ve got this apartment: we have a teeny tiny courtyard that’s perfect to sit in and eat and drink delicious things and do nothing (or read, or blog, or talk; we might roleplay but haven’t got round to that yet). Yesterday we found our bearings in the city, today we actually went to things. We haven’t found the covered market yet though we know it exists, quite close to where we are [ETA: found a covered market, at least, not the one we were looking for. But it was closed, it being miercoles. Wednesday is the Spanish Monday. ], but the little supermarket right round the corner and the huge supermarket at less than 10 minutes walk provide amply for our needs. The past couple of days we’ve been going to early Mass, yesterday after breakfast because we were aiming for the one starting at 9:30 but turned out we were catching the end of the 9:00 one in the adjacent other church, which was much nicer both in time and in atmosphere. The church that we found on Sunday night was quite full, children and all, but it’s the Jesus de Gran Poder church, and the Gran Poder is expressed by a huge statue of Christ, dressed in purple, carrying a cross, as if it’s Good Friday. It reminded me of the Passionist church we went to in A Coruña: interesting for one service but I wouldn’t want to go there always. Today we arrived neatly at St. Lawrence’s church at 8:55 (with laundry done!) and had breakfast at a corner cafe. Wanted to go to Alcazar (not the Alcazar, al- is already “the”, it’s from Arabicاَلْقَصْر al-qaṣr, “the castle” or “the palace”) but there was a queue that looked like it would take hours. (Spouse found out that parts of Game of Thrones were filmed there so apparently lots of people want to see it who otherwise might not be interested.) I’d already tried to book online but they didn’t have any tickets for any of the days we’ll be here, but Spouse tried it without the royal apartments because he thought that might cause the lack of tickets and succeeded in buying two. After seeing that the cathedral queue was shorter we spent about a quarter of an hour in it without it moving. I lent my pen to a Dutchwoman behind me, but when she was done with it we escaped (to the shadow) and tried to buy tickets online for that and failed because the mobile site is crap. At home on the laptop it did work, but it needed lots of information like Spouse’s passport number! And we need to print the tickets, so have to find an Internet shop tomorrow. Pallas Athene looking about twelve. We’d seen something interesting on the way to Alcazar and the cathedral, so we went there instead: the palace of a countess. Splendid! I’d have liked to spend much more time on the upper floor than the guide let us have (also, she pointed out all the “important” things, and there were many more interesting things!). The countess was a great collector, and her house is full of antiquities and fragments of antiquities and restored Roman mosaic floors — she was actually one of the first people to restore mosaics by modern methods. And she wasn’t afraid to have her house altered to accommodate her finds, so there’s an eight-sided room in the middle of the house because she had a huge eight-sided Roman mosaic. We had a bocadillo (sandwich bun) with chorizo for lunch, but I misjudged where my plate was because of the intersection of the reading and middle-distance parts of my glasses, and put a half-full glass of wine on the edge of my plate so it fell over and broke. Oops! Pity about the wine, it was excellent, and I don’t know if I dare show my face there again though the food was also excellent. The Museum of Fine Arts is free for EU citizens! And one of the guards spoke to us in Dutch — his Dutch sounded about as good as our Spanish. We got a bit tired of one Virgen Inmaculada after another, and of yet another St Francis or other male monastic saint having visions or doing penitence, but some of the things were very good indeed: woodcut half-reliefs, some of the paintings even from centuries I don’t usually like the output of (like the nineteenth), Saint Luís looking with disgust at the little dragon rising from his cup, a Virgin and Child where I could see that the Virgin had had the same model as one of the saints in another picture by that painter and the child looked so much like her that the model must have been her own child. We might go again (hey, it’s free! and quiet enough except that you’re likely to be trampled by school parties if you don’t look out) to see just the things we want to see, and take pictures, because we had to put even our small shoulder bags in the locker and forgot to take phone and camera out. Coming out of the museum we were so thirsty that we sat down in the first place that had shadow and had a large cold beer, and then went to the supermarket and home. So tired that Spouse took an actual siesta on the bed, and I lay down on the couch and must have slept (because I dreamed, and I got up a bit disoriented) but very lightly (because I remember my surroundings, too). I sort of want to buy a fan, and a purse (they do gorgeous leatherwork here and I need a new one), but not from any of the tourist shops, so I’m keeping my eyes open but I don’t know where to go. Perhaps the online acquaintance I haven’t told yet that I’m here (he knows, anyway) will know a good place. Added some signs to my collection and posted them on Mastodon, but otherwise saving them for a signage post like the one I made after the previous trip to Spain. The last evening in Barcelona we met friends for dinner: in their neighbourhood, first with a beer in their social club, and then in their favourite restaurant. It’s amazing that people (three youngish guys: two in the kitchen and one waiting tables) can have a restaurant where they do nothing at all to the interior, except keep it scrupulously clean (no decoration at all!) and cook SO EXTREMELY WELL. Okay, the main dishes were just ordinarily very good, but the starters and desserts were quite extraordinarily good. Fish balls again (but much better), tiny artichokes tossed in spiced flour and deep-fried, octopus on very garlicky mashed potato, and flatbread topped with [whatever], which seems to be a Catalan staple. Then we had various meats and fishes, and finally I had mel i mata, which is a fresh cheese more solid than quark and more hanging-together than cottage cheese and firmer than ricotta, with honey and hard twice-baked biscuits that our friend says are what the Italians stole cantuccini from. I wish I’d thought of buying a whole bag of those while I was still in Barcelona! Then, in the morning, we didn’t have time to go to Mass again because we needed to take a 10:00 train. So we took a taxi at 8:15 and had time for breakfast at the station, and I even went to the station souvenir shop to see if I could get a mosaic lizard (which I didn’t buy in the town centre, though I really wanted one). They had only flat lizards with a mosaic pattern printed on: never mind, then. They did have awesome plush dragons, green and red, but I had only 10 euros in my pocket and they cost 17,99 so I left them. Perhaps on the way back! The AVE (high speed train) pretends it’s a plane, only on the ground: it has baggage check in a huge machine, but there was only one bored-looking woman looking at a screen and waving us through. Then we had to check in at a desk, where a man first told us to come back 20 minutes before the train would leave, and then waved us through after a cursory glance at our Interrail passes too. We’d been led to expect that they’d want ID, but nobody asked for it, neither in Barcelona nor in Madrid. From Barcelona to Madrid we had such a smooth train! It was only when it achieved a speed of over 300 km/h that our ears started protesting. Not even in the numerous small tunnels as the train went right through hills and mountains. The South Catalan Plain has more silly-looking small round hills than is seemly for something called a “plain”. Also, the south end of Catalonia and the north end of Aragon are so desolate that one might as well be on the moon: occasional bushes, but most of it arid and empty sandy/rocky landscape. I didn’t see nearly enough people and animals anyway until we were well south of Madrid: north of Madrid Spouse saw 4 black sheep, and I saw one fox (which didn’t look red enough but it was absolutely the right shape) and two large black cows or bulls and a clutch of either geese or swans in a meadow, large and white and far away. Oh, and one man walking a dog, a man on a bicycle, and when we were almost in Madrid some people working on their allotments. Announcements were in Castilian, Catalan and English, and I wondered whether they’d stop doing it in Catalan after we left Catalonia but they kept it up right until Madrid. The train arrived in Madrid ten minutes early, so we had 40 minutes to change there, and we needed 33 of those! Because the station of Madrid really thinks it’s an airport, with separate arrival and departure terminals and a moving pedestrian belt. Fortunately the person at the baggage-security machine didn’t even look at her screen, and the one at passenger check-in waved us through even quicker than in Barcelona (though she did type a number wrong and her terminal said ERROR in angry red). From Madrid to well into Andalusia we had very samey landscape. Olive orchards, and little hills, and little hills with olive trees on them, and olive trees, and hills, and did I mention olive trees? It was actually exciting to see a flock of assorted sheep (and I mean assorted: white and brown and black, young and old, big and small) among the olive trees. And to see cork oaks among the olive trees occasionally. Then we started seeing orange orchards! And orchards that were obviously going to bear other fruit that we couldn’t determine from the flowers. We were about twenty minutes late in Sevilla, but at least we were in Sevilla! The taxi took us to the corner of the street that our apartment was on because it’s too narrow for cars. We found the house but nobody was there to let us in, so we tried calling; and again; and someone told Spouse to go to No.1 and the street doesn’t seem to have a No.1 at all, but he’d meant press the #1 bell of the house we’d already found. We got it sorted out. The man who let us in is the father of the actual landlord, and doesn’t speak anything but Spanish, so we got to exercise ours (and use Google Translate on the phone when words failed us). We got instruction in the use of the keys; now I can use them but Spouse can’t yet, but I think he’ll learn. 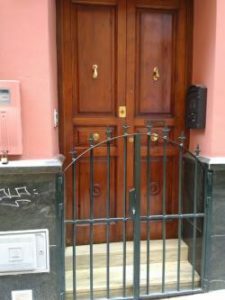 Two doors and two gates to open and close (and some to lock)! This apartment is SO GOOD. We have everything — well, except a sharp kitchen knife, but we’ll remedy that tomorrow. We got a whole tray of delicacies and a bottle of very okay wine as welcome present. There’s a slightly larger than small supermarket right around the corner. We’ve already found a church near enough to just pop in, though the morning service is very late (9:30; we’d have preferred 8 but this one best fits our principle to go to the nearest church). We’ve cooked in the kitchen (asparagus and supermarket ready-made meatballs that only needed some extra smoked paprika in the sauce). We’re SO HAPPY! And we’ve got this for another two weeks.